Can someone point me in right direction how to fix this. I assume that synchrony url should be http://192.168.0.1/synchrony/v1 but i don't know where to change this. Please let us know more about what you are setting up. You linked documentation for Confluence Data Center, but the diagram you posted from Administering Collaborative Editing is standalone server architecture. If you are installing a standalone instance please see Troubleshooting Collaborative Editing. If you need to set up Synchrony for Data Center, please follow: Configuring Synchrony for Data Center. The synchrony proxy does not work with Data Center. I look forward to hearing how it goes with these guides. 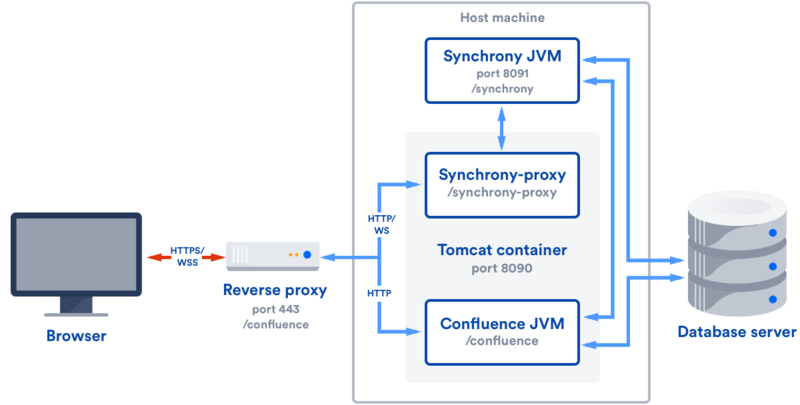 i have managed to setup Synchrony without internal proxy as suggested following Install Confluence Data Center. I'm running both Synchrony and Confluence on same nodes. Now i have issues with F5 because whenewer i have both nodes working i can't enter /admin site and i can't create pages. i will open a new Question if i will need help.